Amazon Glacier is a low cost cloud storage as a part of Amazon AWS services. We can store our data to Glacier at a very low cost. It is great to store data that is not frequently accessed. Today, we are going to give a short review of FastGlacier software. It’s an Amazon Glacier Client for Windows. It support Windows 10, Windows 8. FastGlacier is a free (for personal use) software. You can use this software for free but the upload speed is a bit limited. The new version of FastGlacier 3.5.9 is now available for download. You can find the download link at the end of this post. We are installing this software on Windows 10 Professional. Everything works flawlessly. We love the simple user interface of this cloud backup software. It comes with an intuitive layout where we can easily manage Amazon Glacier accounts, create and delete vaults, download and upload files or folders. The user interface also provide progress while downloading or uploading files in real time. This program allows us to add new Glacier account by providing Amazon access key ID and secret access key. There is also an option to encrypt the access key using master password. A smart filter feature is available in this software. This feature lets us to apply some filters to include or exclude files or folders to the upload process. 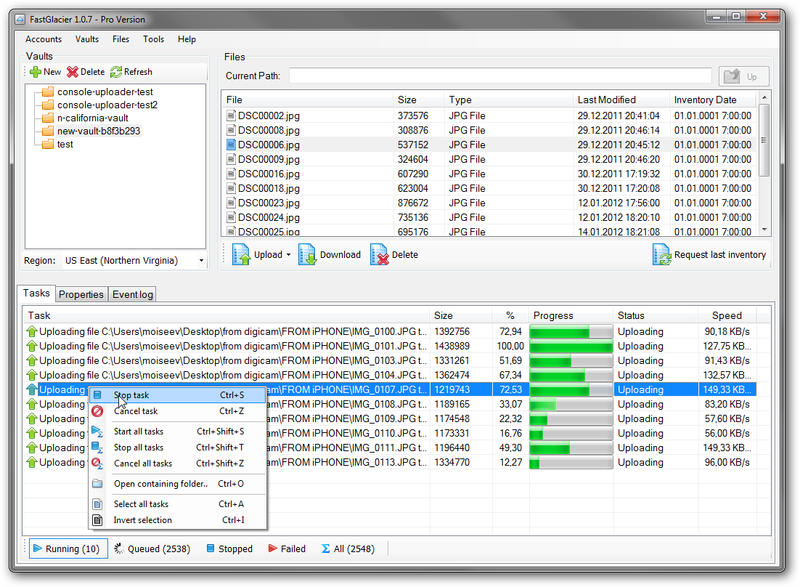 The filter can be filename, size and file attributes. You can download FastGlacier 3.5.9 from the link we provided below. This is the free version and you may upgrade to the paid version if you need more upload and download speed. Please read the comparison between free and paid version here.